to protect your drivers and fleet operations. If the driver exceeds the speed limit while approaching a fixed speed camera, Sygic Professional Navigation alerts the driver and indicates the speed limit. 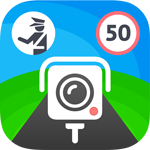 The feature is also available in online mode, where it constantly updates the driver about new mobile camera locations and warns him or her whenever a new speed trap appears on the route. This service is forbidden in certain countries. The preferred right turn (left in countries and territories with left-hand traffic) functionality avoids time-consuming and dangerous left turns at intersections against incoming traffic. Allows vehicle hardware producers to bring the navigation interface into the driver’s line of sight by linking directly with the navigation functions, and projecting the route information onto a built-in screen on the dashboard or other display systems. Enables a screensaver mode that turns off the navigation screen on highways to reduce battery drain. The navigation screen reappears 5 km before the next turn or can be reactivated by a simple tap on the screen. When driving at night, Sygic Professional Navigation Night mode turns on automatically to preserve night vision while driving.